Next Thursday [10 May 2018] is Ascension Day. 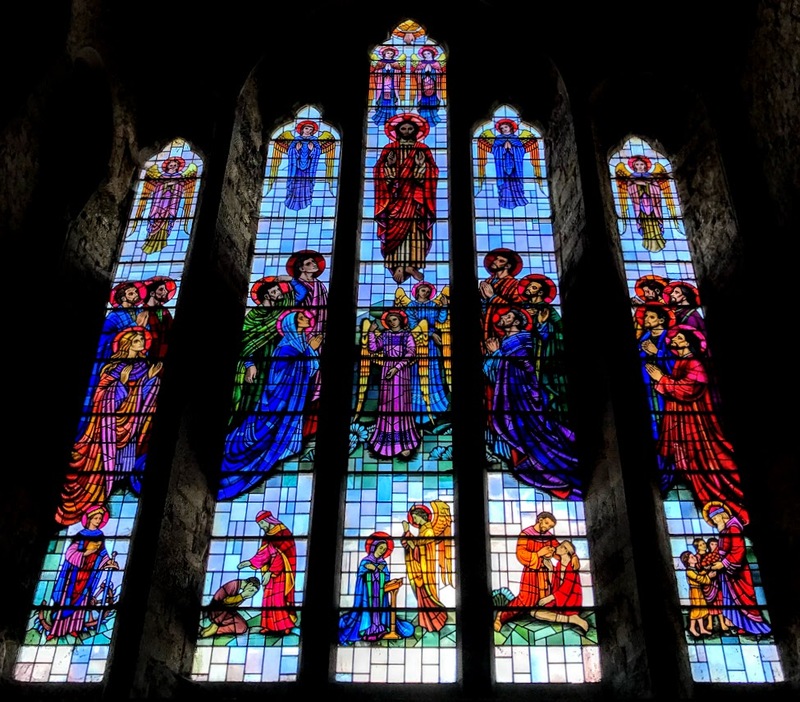 The timing of the General Synod of the Church of Ireland this year and the date for Ascension Day means that many clergy are not going to be in their parishes on Ascension Day. 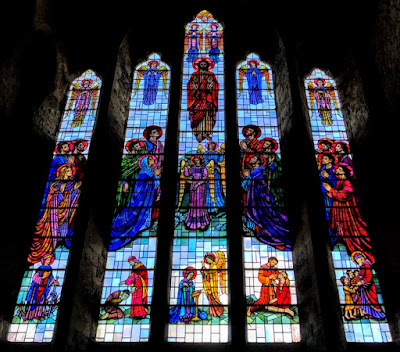 However, this posting is offered as a resource for priests and readers for planning Ascension Day. 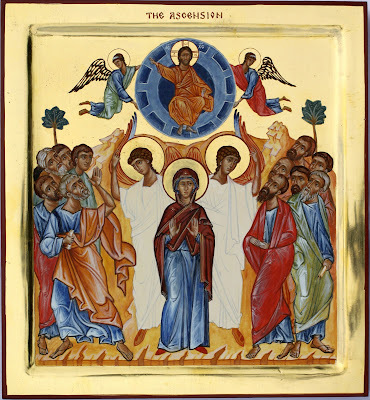 The Readings for Ascension Day in the Revised Common Lectionary are: Acts 1: 1-11 or Daniel 7: 9-14; Psalm 47 or Psalm 93; Ephesians 1: 15-23 or Acts 1: 1-11; Luke 24: 44-53. The presumption is that the reading from the Acts of the Apostles is read as either the first or second reading, and that it must not be omitted. Our view of the universe, our understanding of the cosmos, shapes how we image and think of God’s place in it, within it, above it, or alongside it. And sometimes, the way past and outdated understandings of the universe were used to describe or explain the Ascension now make it difficult to talk about its significance and meaning to today’s scientific mind. The Ascension is one of the 12 great feasts of the Church, celebrated on the 40th day of Easter. In the Orthodox Church, this day is the Analepsis, the ‘taking up,’ or the Episozomene, the ‘salvation,’ for by ascending into his glory Christ completed the work of our redemption. Today we celebrate the culmination of the Mystery of the Incarnation. On this day we see the completion of Christ’s physical presence among his apostles and the consummation of the union of God and humanity, for on this day Christ ascends in his glorified human body to sit at the right hand of the Father. The Ascension is the final visible sign of Christ’s two natures, divine and human, and it shows us that redeemed humanity now has a higher state than humanity had before the fall. That’s the theological explanation, in a nutshell. By how do you image, imagine, the Ascension? When Christ went up through the clouds, how long did he keep going? Standing there gaping at the sky could make us some kind of navel-gazers, looking for explanations within the universe and for life, but not as we know it. In our day and age, the idea of Christ flying up into the sky and vanishing through the great blue yonder strikes us as fanciful. Does Jesus peek over the edge of the cloud as he is whisked away like Aladdin on a magic carpet? Is he beamed up as if by Scotty? Does he clench his right fist and take off like Superman? Like the disciples perspective, would we have been left on the mountain top looking up at his bare feet as they became smaller and smaller and smaller …? But the concept of an ascension was not one that posed difficulties in Christ’s earthly days. It is part of the tradition that God’s most important prophets were lifted up from the Earth rather than perish in the earth with death and burial. Elijah and Enoch ascended into heaven. Elijah was taken away on a fiery chariot. Philo of Alexandria wrote that Moses also ascended. The cloud that Jesus is taken up in reminds us of the shechinah – the presence of God in the cloud, for example, in the story of Moses receiving the law (Exodus 24: 15-17), or with the presence of God in the Tabernacle on the way to the Promised Land (see Exodus 40: 34-38). Saint Luke makes a clear connection between the ascension of Moses and Elijah and the Ascension of Christ, when he makes clear links between the Transfiguration and the Ascension. At the Transfiguration, he records, a cloud descends and covers the mountain at the Transfiguration, and Moses and Elijah – who have both ascended – are heard speaking with Jesus about ‘his departure, which he was about to accomplish at Jerusalem’ (Luke 9: 30-31). So, Saint Luke links all these elements as symbols as he tells this story. 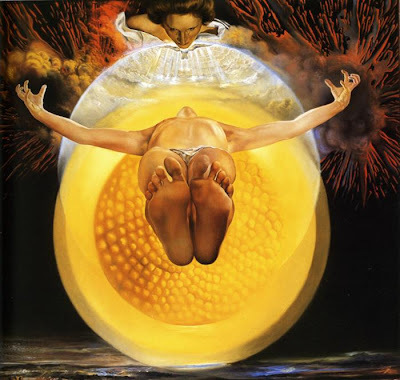 There is a direct connection between the Transfiguration, the Ascension and the Second Coming … the shechinah is the parousia. However, like the disciples in the reading from the Acts of the Apostles, we often fail to make these connections. We are still left looking up at the feet, which is the enigma posed by Salvador Dali 50 years ago in his painting, The Ascension (1958). Let us just think of those feet for a moment. In the Epistle reading, the Apostle Paul tells the Ephesians that with the Ascension the Father ‘has put all things under [Christ’s] feet and has made him the head over all things’ (Ephesians 1: 22). Feet are important to God. There are 229 references to feet in the Bible and another 100 for the word foot. When Moses stands before God on Mount Sinai, God tells him to take his sandals off his feet, for he is standing on ‘holy ground’ (Exodus 3: 5) – God calls for bare feet on the bare ground, God’s creation touching God’s creation. Later, when the priests cross the Jordan into the Promised Land, carrying the ark of the Lord, the water stops when they put their feet down, and the people cross on dry land (Joshua 3: 12-17): walking in the footsteps of God, putting our feet where God wants us to, is taking the first steps in discipleship and towards the kingdom. The disciples object when a woman washes and anoints Jesus’ feet and dries them with her hair, but he praises her faith (Luke 7: 36-50). On the night of his betrayal, the last and most important thing Jesus does for his disciples is wash their feet (John 13: 3-12). Footprints … many of us have learned off by heart or have a mug or a wall plaque with the words of the poem Footprints in the Sand. We long for a footprint of Jesus, an imprint that shows us where he’s been … and where we should be going. The place where the Ascension is said to have taken place is marked by a rock with what is claimed to be the footprint of Christ. And, as they continue gazing up, after his feet, the disciples are left wondering whether it is the time for the kingdom to come, are they too going to be raised up. Yet it seems that the two men who stand in white robes beside them are reminding them Jesus wants them not to stay there standing on their feet doing nothing, that he wants us to pay more attention to the footprints he left all over the Gospels. Christ’s feet took him to some surprising places – and he asks us to follow. Can I see Christ’s footprints in the wilderness? Can I see Christ walking on the wrong side of the street with the wrong sort of people? Can I see Christ walking up to the tree, looking up at Zacchaeus in the branches (Luke 19: 1-10), and inviting him to eat with him? Can I see his feet stumbling towards Calvary with a cross on his back, loving us to the very end? Am I prepared to walk with him? Since that first Ascension Day, the body of Christ is within us and among us and through us as the Church and as we go forth in his name, bearing that Good News as his ‘witnesses in Jerusalem, in all Judea and Samaria, and to the ends of the earth’ (Acts 1: 8). Meanwhile, we are reminded by the two men in white: ‘This Jesus, who was taken up from you into heaven, will come in the same way as you saw him go into heaven’ (Acts 1: 11). Between now and then we are to keep in mind that the same Jesus is ‘with [us] always, to the end of the age’ (Matthew 28: 20). The traditional icon of the Ascension shows Christ ascending – and descending – in his glory, blessing the assembly below with his right hand, a scroll in his left hand as a symbol of teaching. Christ continues to be the source of the teaching and message of the Church, blessing and guiding those entrusted with his work. As people sent to spread the good news, we must leave behind us the footprints of Christ. Saint Paul paraphrases Isaiah when he says: ‘How beautiful are the feet of those who bring good news!’ (Romans 10: 15). Our feet can look like Christ’s feet. Our feet can become his feet until he returns in glory once again (Acts 1: 11), when he returns exactly as he ascended. And we need to keep the tracks fresh so that others may follow us in word, deed, and sacrament, and follow him. The disciples are sent back to Jerusalem not to be passive but to pray to God the Father and to wait for the gifts of the Holy Spirit. In time, the Holy Spirit will empower them, and they will be Christ’s witnesses not just in Judea and Samaria, but to the ends of the earth fulfilling that commission in Saint Matthew’s Gospel. In an old Ascension Day tradition in the Church of England, parishioners carried a banner bearing the symbol of a lion at the head of the procession, and a second banner bearing the symbol of a dragon at the rear. This represents the victory of Christ over the devil. 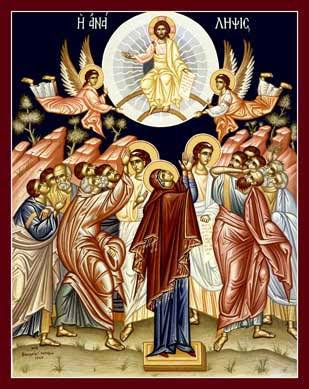 For many Christians, the meaning of the Day of Ascension is found in the sense of hope that the glorious and triumphant return of Christ is near. It is a reminder of the Kingdom of God within our hearts, and of the ever-present Spirit of God, watching over and protecting us as we spread the light of Christ and his truth throughout the world. and have fed us with the bread of heaven. where he now lives and reigns for ever. 261, Christ, above all glory seated!